Here is another quick and easy project that could be used in a children’s bedroom, classroom, office or even for a Rainbow birthday party decoration. Again, I can’t take credit for this idea. I saw it on pinterest and just had to make a set for my classroom. Purchase a set of jars at the dollar store. Add water and food colouring to each jar. Seal and shake to mix. Place on a window ledge to catch the light. You will notice that I don’t have all of the colours of the rainbow and they are not actually set-up in rainbow order. I played with the order until I like it. Unfortunately, when I was taking the photo for this post, it was overcast. 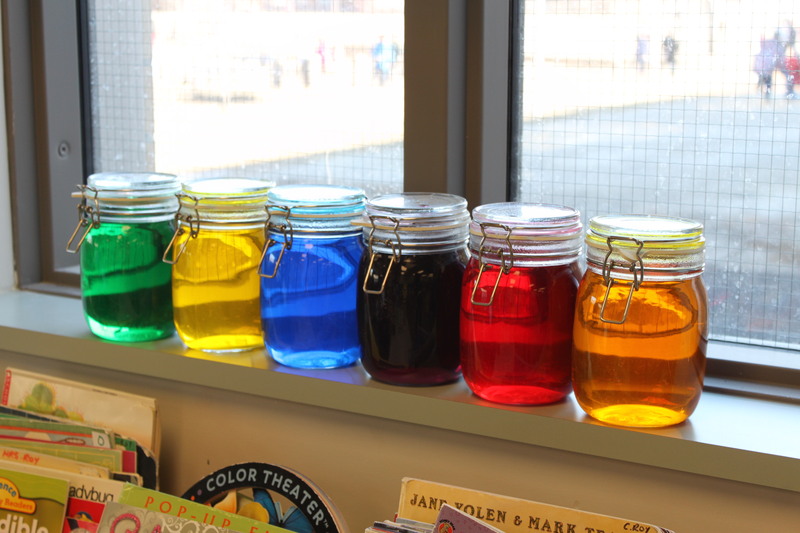 When the sun shines in the classroom windows, it creates a beautiful reflection of light and colour through the jars. The children love to look at them. The original poster had the jars set up in her kitchen. I am not sure that would work for me, but it gets me thinking that it might look cool to create a set in different hues of the same colour for home decor. Posted on November 21, 2013 by Cindy Roy •	This entry was posted in Home Decor, Kindergarten Decor & Ideas and tagged children's decor, decorating kid's rooms, rainbow birthday party, rainbow jars. Bookmark the permalink.